Several cast members from The Sweet Body of Deborah were reunited a few years later for this above average giallo which boasts groovy London locations (again demonstrating that Euro-filmmakers were far better at using English settings than native ones) and a script that is so convoluted that you could stuff it in your chest cavity and use it to digest food. Evelyn Stewart plays yet another icy maiden with a bizarre line in eyebrow twitching, an heiress whose husband has died in a (very cheesy toy) plane crash and left her a cool million dollars. The insurance firm that has to pay out is suspicious and puts ace investigator Peter Lynch (George Hilton) on the case. Before long, he stumbles into her hotel room and finds the dame with her throat cut open and the money missing. From here the number of suspects widens to include a dodgy police inspector (Alberto De Mendoza), a haughty broad and her mute manservant (Janine Reynaud, Luis Barboo) and a female reporter (Anita Strindberg). Of course, seeing as George Hilton is in this there’s no question as to who the murderer actually is, but it’s an entertaining ride nonetheless. Sergio Martino directs a damn fine thriller, and this is one of his best. 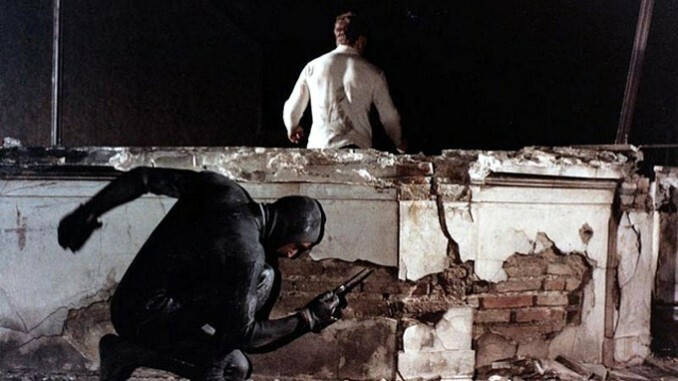 Taking his cues from Dario Argento’s Bird With the Crystal Plumage there is a black gloved killer who sports a nifty line in dark polo neck jumpers set off by a similarly coloured stocking over the head. Tension is well built, and a couple of sequences are especially noteworthy: Stewart being pursued as she walks down a canal path, the introduction of Reynaud’s character and the climactic sea-bound cat-and-mouse chase. There is a strange proto-Goblin soundtrack and a cool array of threads and decor. JB Whisky is prominently shown at every opportunity, demonstrating that product placement is by no means a new phenomenon. 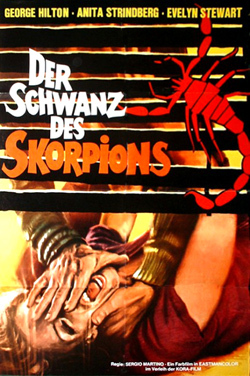 The Case of the Scorpion’s Tail may be derivative and have more holes in it than St. Sebastian, but it remains a highly enjoyable undertaking that possesses enough style to ensure that it sticks in the memory; it’s probably the most underrated of all Martino’s early seventies giallos but possesses enough style and distinction to stand up with the likes of his better known works such as The Strange Vice of Mrs. Wardh or Torso.